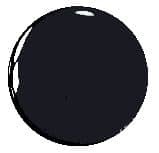 This is a very dark black which gives good results in clear and opaque soap bases. It is a dye, so it will bleed if this important to you. This is a very dark black colour which gives excellent results in melt and pour soap bases. As with all of the water based dyes, they are concentrated and can be further diluted for ease of use with deionised water. It's important to point out that this is a dye and it will bleed if you are using it in layers or next to a different coloured soap base. This colour is suitable for melt and pour soap making but has not been tested in cold process soap making.